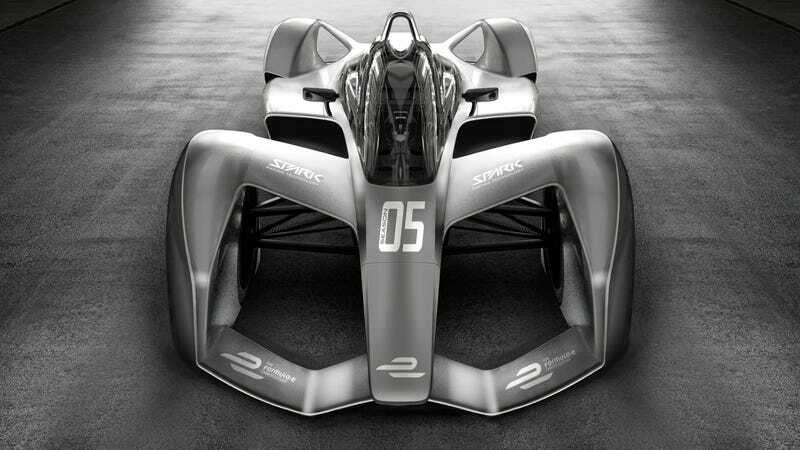 Meet the new Spark SRT05e, the concept for the next generation Formula E car set to debut in 2018. It looks badass, it’s safer than the current car and best of all, it incorporates a bigger battery to kill off the confusing, goofy mid-race car swaps once and for all. Formula E may finally be worth watching. Formula E has been somewhat of a punching bag for many racing enthusiasts over everything from the FanBoost gimmick to the high-pitched whine the cars emit in place of an internal combustion engine’s roar. One of the biggest problems fans have taken issue with is the fact that the cars haven’t had enough power on-tap to make it the full distance of one race, necessitating a car swap in the middle of the race to get to the end. Fortunately, when Formula E shopped around for a new spec chassis for its fifth season onward, part of the deal was they needed to incorporate a new, heavier battery that Spark claims will make the cars 10% heavier. McLaren Applied Technologies developed the new batteries, which will boost the cars’ power from 28 kWh to 54 kWh, according to Racer. To compensate for the added battery weight, Spark gave the SRT05e more efficient aerodynamics and a more efficient drivetrain. Weight has been trimmed from other parts of the vehicle as well. Safety, of course, cannot be ignored, and we can see a couple different options for driver head protection added to the SRT05e in the renders: a windscreen similar to the one Red Bull was testing in the side view, and a fully enclosed canopy in the front view. Spark, which supplied Formula E with its first run of cars and is owned by former Renault Formula 1 team principal Frédéric Vasseur, now has the contract to make the next-generation Formula E racers from the series’ fifth season in 2018 and 2019 onwards. Spark will be working with chassis manufacturer Dallara to produce the cars, which should look a tad different from these renders, according to The Verge—but hopefully not by much. I love how the SRT05e looks, and a cool-looking car that goes the full race distance is exactly what Formula E needs.